Bruxism is the term describing nighttime tooth grinding or jaw clenching. This can result in tooth wear, gum recession, and morning headaches or stiff muscles. Most of the time we are not aware that we clench or grind at night. Jaw-joint symptoms will get worse if clenching is not addressed. After continued bruxism the teeth will wear down and the jaw-joint can be damaged over time. A lot of times you may hear about the warning signs from your hygienists, if they are trained to look for these symptoms. 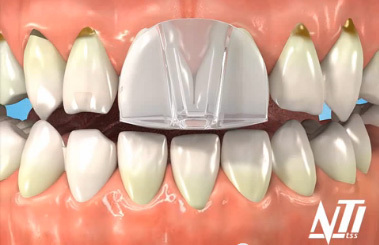 A night guard is a thin piece of hard plastic molded according to an impression of your teeth that is placed on the upper teeth while you sleep. 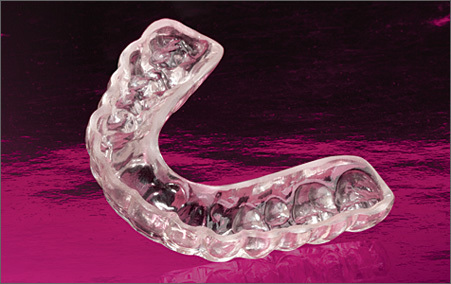 The night guard is hard enough to be durable but it is softer than teeth and protects them from wear. A night guard protects your teeth and jaw from the detrimental effects of nighttime teeth grinding. The pressure created by grinding can eventually wear your teeth down to nothing! Other warning signs that you may be grinding your teeth at night include headaches (sometimes severe) and jaw pain when you wake up in the morning. A conventional hard BPA-free nightguard, which is our favorite. 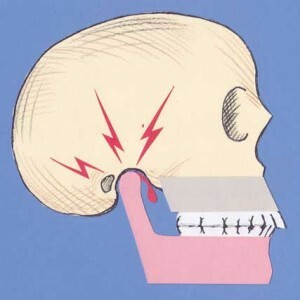 The NTI is much smaller, and where indicated, works great for bruxism when associated with headaches. In a multi-center trial of the NTI device, 82% of sufferers had a 77% reduction within 8 weeks. Just a single visit to our office could make migraine suffering a thing of the past. This entry was posted in Education, Headaches, Tooth Grinding (Bruxism) by Admin. Bookmark the permalink.